“In Hanoi, chicken has literally been crossed off the menus of many restaurants and hotels. But in the bustling wet markets of Quang Ninh hawkers still sell gizzards, organs and slabs of chicken on tables splattered with blood” screams a leading article in the recent issue of “ The Lancet” medical journal. 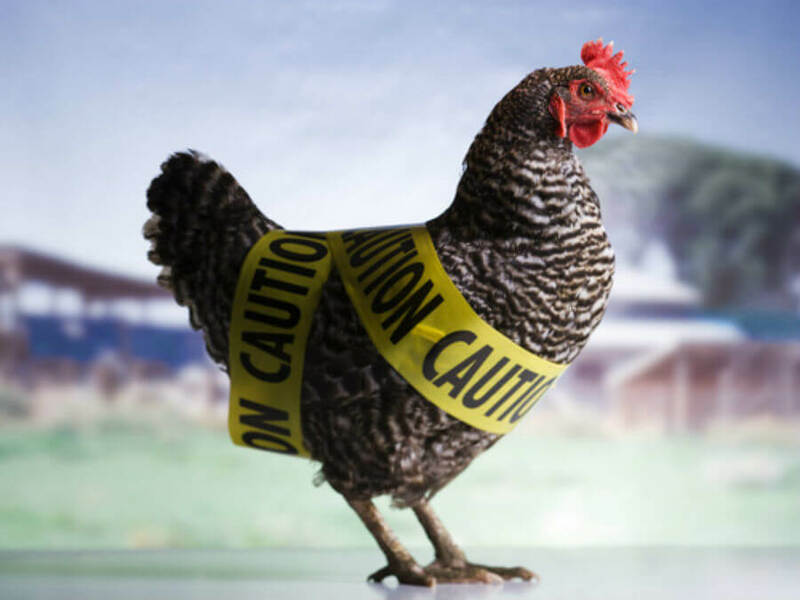 Bird flu or avian influenza H5N1, infection is spreading through South East Asia, Africa, Middle East and has now established a foothold in Europe. Influenza is caused by three related viruses-Influenza A,B and C. While B and C viruses are found mostly in humans, the ‘A’ virus strains infect water-fowl, primarily ducks. The ducks can withstand avian flu making them ideal carriers-but chicken have little resistance and succumb to the infection. Bird flu viruses do not usually affect humans. But under certain circumstances the ‘A’ virus can cross the species barrier and abruptly change its genetic blue print, resulting in deadly outbreaks of infection. When two different viral subtypes infect the same host cell the RNA segments and proteins from both types can become jumbled together creating new viral particles; the human immune system could not recognize or form antibodies to the new variant. The type A influenza virus has several subtypes-there are 15HA(haemagglutination protein.) and 9NA (neuraminidase…protein) subtype, the subtype known as H5N1 is implicated in the present crisis. Humans acquire infection through affected chickens which shed the virus in the faeces, saliva and nasal secretions. “Bird-droppings” may contain abundant viral particles. The dried up powdery secretions/ excretions from the bird are inhaled by humans resulting in infections. Historically, pandemics of influenza have been recorded worldwide from 1900 onwards. The “Spanish flu” of 1918-19 caused by H1N1 subtype is the most lethal pandemic of influenza ever-killing more than 20 million people in 16 weeks. During 1957-58, “Asian flu” H5N2 pandemic started in South West China and spread worldwide resulting in more than 750,000 deaths. The “Hong-Kong flu” pandemic during 1968-69 caused by H3N2 strain killed 700,000 people. In 1997 in Hong Kong H5N1 avian virus infected 18 people killing 6. In 2003-05 in Asia, the H5N1 strain6 has spread to humans, of 117 people infected, 64 have died. In October 2005, virus has spread to Europe. As emphasized earlier spread is mainly through contact with infected birds’ secretions. People who come in contact with affected birds are at risk. Avian flu is not a food-borne virus; hence the risk from eating properly cooked poultry is negligible. In countries like Vietnam where the disease has taken its toll, consumption of partially cooked meat is a common practice. “duck-blood pudding” for instance is considered a delicacy in certain parts of Vietnam – a deadly dish indeed. The major problem faced by the doctors who have experience in treating the disease in places like Indonesia and Vietnam is the lack of laboratory facilities to process the blood of suspected cases quickly and accurately. In Hanoi’s Pichmai Hospital, Nguyen Van Thong, runs the country’s leading contagious disease unit and has dealt with more than H5N1 cases than any other doctor in the world. Getting an early lab diagnosis is a major practical problem in dealing with suspected cases, she says. A similar situation could arise in India as well. According to WHO, Vietnam has killed 46 million ducks and chicken in a campaign that has so far cost the country £ 120 million. In India, there appears to be a nationwide panic following reports of avian flu being confirmed in Maharashtra. In the last few days, more than 2 lakh chicken have been culled in Maharashtra. Elsewhere in Karnataka large-scale deaths of chicken have been reported, though they are now known to be due to an entirely different problem- Ranikhet disease as confirmed by appropriate diagnostic tests. The situations as of now is far from clear as conflicting reports emerge from different sources. The dust has to settle down before a clear picture could emerge. In the meanwhile, adequate precautions as with any infection outbreak would suffice. The “Spanish flu” of 1918-19 caused by H1N1 subtype is the most lethal pandemic of influenza ever-killing more than 20 million people in 16 weeks. During 1957-58, “Asian flu” H5N2 pandemic started in South West China and spread worldwide resulting in more than 750,000 deaths.